Dianna McDowell, a regular Big Luncher and founder of the Molly and Mia Foundation, tells us why The Big Lunch is so important to her community and her charity. 'The Big Lunch is definitely the way forward for bringing communities together'. How did you first hear about The Big Lunch? I picked up a Big Lunch pack a few years ago at The Balmoral Show. I realised that team members from our charity, the Molly & Mia Foundation, had been involved in previous Big Lunches, just not under our name. When I saw that there was a weekend camp at the Eden Project for people wanting to get more involved in the Big Lunch I just had to register because I felt that they needed me and I needed them! I’ve always been a big community fundraiser and organiser and I work with an amazing team of helpers. Can you tell us more about your charity — the Molly & Mia Foundation? Our charity was formed six years ago — a few months after my darling twin daughters, Molly and Mia, died at birth because of pregnancy complications. I was very, very ill myself but I pulled through. I decided to organise all of my ongoing fundraising efforts into one foundation in the girls’ names. What kind of work does the Molly & Mia Foundation do? When we started the charity, we wanted to bring communities together — with a twist. Thanks to a fantastic team of volunteers we empower children aged 4 to 16 to organise local events. We help them set up Big Lunches as well as big steak barbeques for the community, family Christmas lunches, high teas and cooked lunches. How do your volunteers go about organising their Big Lunches? We run cookery and bakery schools and that’s where the kids get everyone together to take part in the Big Lunch. We teach the children how to make lots of things like pasta dishes, coleslaw and potato salad. We also bring in skilled cooks to show them how to prepare, chop, marinate, cook and garnish things like curries, pizza, garlic breads, bolognese, steak pies and chicken pies. 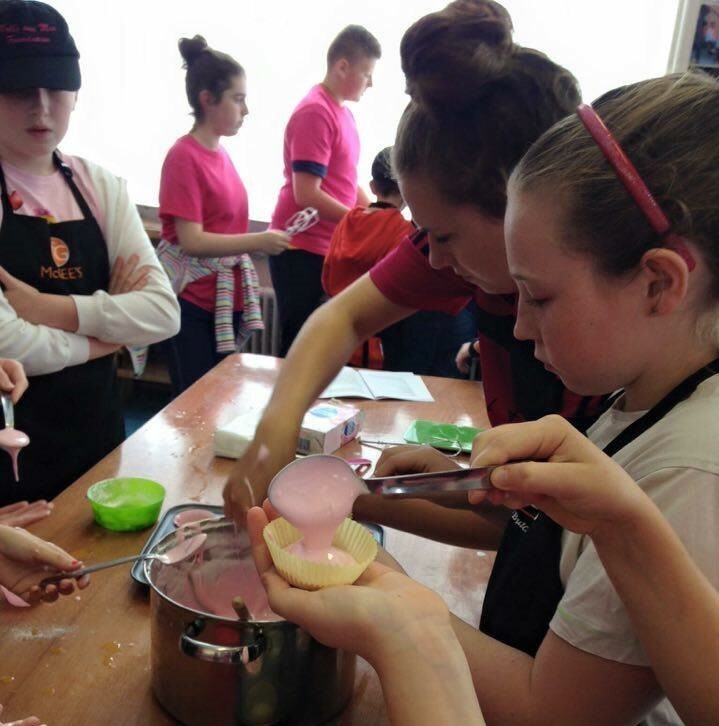 In bakery class they make scones, cakes, sponges and pavlovas — all of which they prepare and decorate, then serve on the day… and they eat them as well, of course! We’re very lucky to have Magees as our sponsors. They’re based in Asda stores and they’re so helpful to us. Without their support, our Big Lunches couldn’t run like this. What’s it like in the run up to The Big Lunch? On the Thursday and Friday before it’s like a very busy hotel kitchen. The children are proudly showing everything they’ve learned in the classes. They’re busy preparing and cooking everything in readiness for our hot Big Lunch sit down meal or for our high tea. And then on the big day? Our kids are dressed up in our smart Magees aprons and our Molly & Mia hats and they’re busy serving the whole community who all come along and eat together. It’s lots of hard work but it’s all worth it when you see families from far and beyond all come together for The Big Lunch. It’s definitely the way forward for bringing communities together. This, in turn, helps the Molly & Mia Foundation as we want families who have lost a baby to come together to get support after their loss. By bringing all these people together they learn more about our charity and they get involved. We then go on to use our beautiful memory garden in Fivemiletown where we run family barbeques all year round. We also run other Big Lunch events at the Galgorm Resort and Spa where families from all over Northern Ireland come together and remember the baby they’ve sadly lost. By everyone working together, from our own volunteers, to the kids we teach, to our kind sponsors, we can make these valuable, much needed events happen. Find out more about the Molly and Mia Foundation. If you’d like to bring your neighbours together, take a look at our Hold a Big Lunch page where you can find tips and ideas, or you can get in touch via Twitter, Facebook or Instagram. We love to hear all about your plans!